So FC Zwolle had been promoted to the Eredivisie for the first time since relegation in 2004 under my managing. 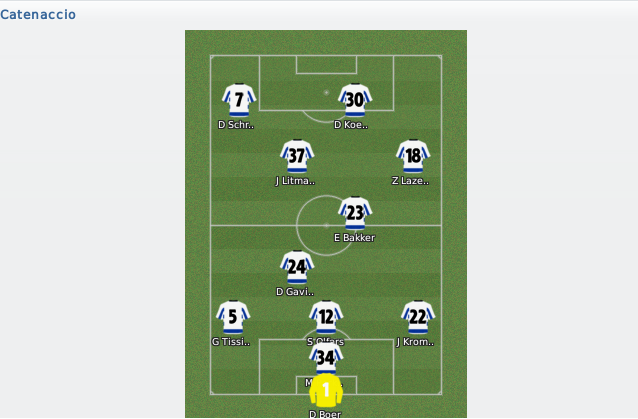 The 2–3–2–3 formation had worked well with plenty of press, constant attacking, solid defending and varied play. Time would tell if that tactic would continue to work. For much of the beginning of the season, I kept to the 2–3–2–3 formation, which had bought so much joy in the previous season. 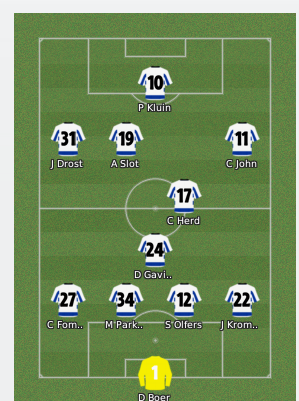 However, this formation didn’t quite save the same effect in the top division. Opposition teams were a lot faster and more ruthless in punishing mistakes. As a result, after the Christmas break, I moved to a tactic reminiscent of Catenaccio, the Italian iron bolt defensive line-up. This was made possible due to the signing of American defender Michael Parkhurst, who was able to play as a sweeper. The set up, pioneered by Inter Milan in the 1950s and 1960s, defined Italian football. The sweeper or libero is important in this formation, he sweeps up and covers the entire back line but also can move forward into attack and play throughballs. The rest of the defence have simple roles. The centre-back defends, and the full-backs are set to automatic, changing role depending on situation. The defensive midfielder operates as an anchor. Linking the defence and midfield, he is like a more advanced sweeper, winning the ball with interceptions and linking up with more creative teammates. The man directly in the middle operates as a ball winner, looking to win the ball but unlike the anchor man is required to get more involved in attacks. The three behind the main man operate as an advanced playmaker, attacking midfielder and inside forward. The striker has to operate as a complete forward, being able to do every potential role in the team. After two months of slow improvement, I decided to mix the tactics up a bit and introduced a new simpler defensive formation. This tactic is simply but with more simple roles. The defenders defend, the defensive midfielders link to the attackers and they feed the front man. For the final run-in and relegation play-offs, however, I went back to my tried and tested Guardiola style 4–3–3, an attacking formation. The key to the formation is balance. The goalkeeper operates as a sweeper and the right back is an attacking wing-back, the two centre-backs are both defensive minded, but the left-sided one pushes forward as a stopper, his job is to read the game and be more ball-playing. The left-back stands off more. His winger is more traditional and as a result pushes forward more as opposed to the right winger who operates as a supporting inside forward, whose job is to cut on. The defensive midfielder sits in front of the back four and drops backs when play dictates. The midfielder sits in the middle pinging balls as the attacking midfielder causes a nuisance for himself. Lastly, the striker is a trequartista. Operating the length of the final third, operating in a free role. In through the door before the season had even reset was Collins John, the striker who had a good breakthrough at Fulham then faded out of view. John, was available on a free transfer after being released by Chicago Fire. A proven Eredivisie striker, it was a gamble that didn’t quite pay of but he did score the goal to beat former club FC Twente ending a run of eight consecutive losses. Also joining in on a free was Eoin Wearen, released by West Ham, he would spend the season in the reserve side. Chris Herd was picked up with his Aston Villa contract expiring, despite a good pre-season, the introduction of others meant Herd hardly featured until the run-off and didn’t really get to show his full potential. Jari Litmanen, AFC Ajax legend, joined for what would turn out to be his final swansong. Litmanen would not scored in his time at the club, as his injuries again proved to cause issues. Still, he was an experienced player which made it a gamble worth taking. 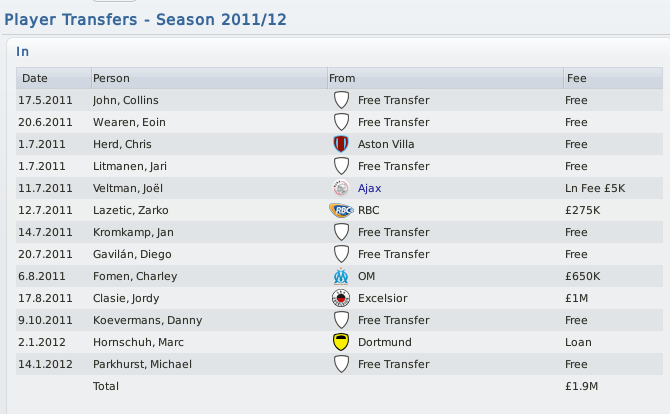 Next in, as the transfer window opened were two players I had been keeping tabs for some time. Joel Veltmann, joined on loan from Ajax, after a season at Volendam, Veltmann is the current Ajax captain, but at Zwolle was part of a leaky backline and didn’t get to progress in the same way fellow Ajax loanee Davey Klaassen had a year before. Zarko Lazetic, RBC player of the season, and the strongest attacker in the second tier was next in. Lazetic, 29, had almost single handedly got his side promoted and I decided to give him the top flight football he deserved. Despite runs without registering many goals, he scored some important ones and would be FC Zwolle player of the season for 2011–12. Jan Kromkamp, 31, would be next through the door, once a solid Champions League right back, he was struggling for first team football at PSV Eindhoven and joined on a free. Performed solidly. Paraguay international Diego Gavilan, formerly of Independiente came in, as a defensive midfielder, but was shockingly bad. Charley Fomen, Cameroonian left back came in from Marseille, and was first choice left-back for most of the campaign but wasn’t always a top performer. Jordy Claise, become the club record signing from Excelsior and was by far the best midfielder at the club, injuries and form meant Erik Bakker didn’t have the chance to form a partnership with him and Claise’s impact was limited by being around technically inferior players. Danny Koevermans came in mid-season after a successful trial, but scored just once all season. In January, Marc Hornschuh arrived on loan from Borussia Dortmund, as part of a new partnership between the two clubs, but failed to have any noticeable impact. The aforementioned Michael Parkhurst joined after an impressive 18 months for FC Nordsjaelland in Denmark and like Olfers the season before was immense, he would’ve won player of the year had he been signed in the summer. Joey van den Berg departs after failing to make a first team appearance at the club during my tenure. Said Bakkati had wanted more first team football and as a result joined Kapfenberger in Austria. Bram van Polen had been immense at right back but turned down a new year deal to join Club Brugge on a bosman. Lim-Duan had primarily been a back-up and agreed a free transfer to Southend United before the end of the season. The majority of our friendlies were held at home, a mixed bag of results but the losses came against superior opposition. A difficult start to the season as at the halfway stage we sat on just seven points. I expected us to struggle due to a weak squad and a low budget. The opening home game against Heerenveen was awful. We found ourselves 0–1 down after 17 seconds and 0–3 down after 20 minutes, we weren’t even being destroyed, it was just three sloppy mistakes. Scheuwrs off the bench for his return after four months out and a Lazetic goal on his debut bought us back to 2–3 but a late fourth was added by Rasmus Elm. 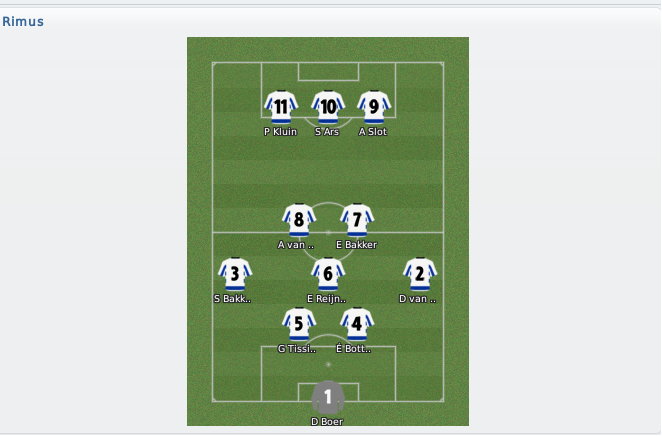 In most games, we were in the contest, but just got unstuck at the back or couldn’t score, we lost captain Boer for a while in September and Ooschenwalt was also out, resulting in U18 keeper Henk Kuipers being promoted to the first team as te Wielen’s deputy. Davy Klaassen’s departure has been hit the team, his strike partners in Kluin and Schreurs couldn’t do the same without him. He turned down the opportunity to return in January, signing on loan for Vitesse. Well, he was now a Chelsea player after all. A midweek tie at home to FC Twente would result in a first three points, with as mentioned before, Collins John bagging home the winner. Days later, a Lazetic double saw the side come back from 1–0 down to beat relegation contenders Fortuna. Our only point before Christmas would come against Groningen, them the in form team of the league. A late Lazetic equaliser after plenty of pressure, a game which we could’ve won easily if we had a bit more luck. A change in tactics saw a slight up turn in fortunes. However, a goal threat went out the window. Another Lazetic goal secured the win against fellow strugglers De Graafschap. It was during this point of the season I turned down job offers from AEK Athens, Botafogo and Cruziero. Tissingh’s winner other fellow side Fortuna was massive but a failure to win at PSV meant the side lost their chance of automatic survival and had to make do with relegation play-offs at best. Kluin finally got his first goal of the campaign, stabbing in the dying seconds at the Phillips Stadion. Coming back from 0–2 down at to NAC Breda, with two goals and a strike from veteran Dave van der Bergh meant Fortuna were going down automatically. A defeat to Roda JC meant we finished the season in 17th rather than than 16th and had to face the play-offs. A Collins John strike would give us the win at Almere City before another Lazetic goal as well as strikes from Claise, John and youth product Jesper Drost’s senior goal sent us to the third round to take on RKC. An own goal as well as strikes from Etienne Reinjen and another Claise goal gave us a 3–1 win lead. We collapsed at home with a Serge Mbilla hat-trick giving RKC a shock 5–0 victory. This meant the match went to a decider. Performance-wise we were worse. We lost 3–0 despite 0–5 being flattery towards our opponents. They were completely in control, we were down despite looking like we might actually retain our top flight status for 2012–13 despite looking hopeless at various points. We reached the fourth round for a second year running, with Kluiper making his pro debut against Rosmalen it was a routine win, second tier RBC forced us to a shootout but we won 4–1 with Lazetic scoring against his former side. Fortuna, who would go down automatically alongside knocked us out at home before the winter break. Lazetic would end the season as Player of the Season. Claise and Parkhurst may have easily won it. With relegation, Kromkamp and Parkhurst would both request to leave. Makhloufi, van der Haar, van den Bergh, Litmanen and Elkhattabi would all retire. Having rejected Galatasaray as well before the end of the season, I would resign as Zwolle coach after two seasons, despite the board being happy for me to stay. I would be at various points linked to major jobs throughout Holland such as PSV, Feyenoord and Heerenveen, all of whom had managers with expiring contracts. 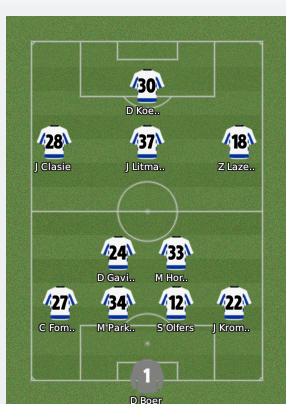 My next pick which was subtly revealed in the last installment would come as a surprise, but I would take Jaap Stam with me as assistant, van der Haar as a coach, Thuirs promoted from youth coach at Zwolle to first team coach as well as a first team Zwolle player. Zwolle may have expected to go down, but considering how well we played and fought at various points, it was a real kick in teeth, with a mass exodus expected and rebuilding required, I felt it was time for a new challenge. I had stayed to try and keep them up when I could’ve gone in the winter, but it wasn’t to be. On to the next challenge….